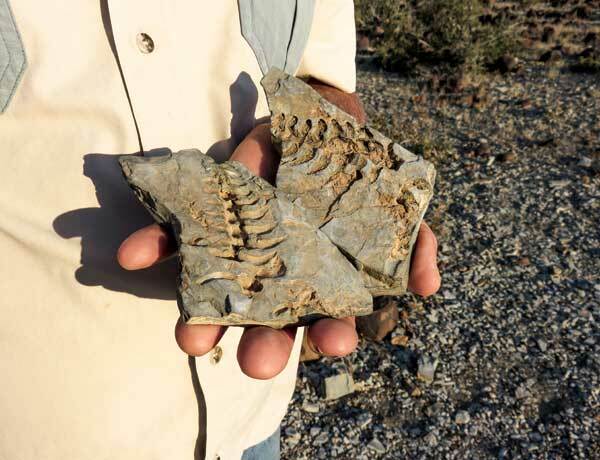 Plan for a fossil adventure 40 km from Keetmanshoop, where you can join a short tour to view the ancient Mesosaurus fossils, overnight in the peaceful Namibian countryside and wander through a quirky quiver tree forest. Twenty-five years ago I built this road here, Giel Steenkamp told me. Initially Giel thought it was a salamander fossil. He showed it to his brother-in-law, a zoology professor at Stellenbosch University, who took the sample with him back to the university. There, Dr Oelofson, who had studied the fossils extensively for his PhD thesis, identified it as an animal from the genus Mesosaurus, a small creature that resembled a crocodile with a long snout and long, needle-like teeth. Giel briefly condensed millions of years of geological history into a few short minutes and explained that 320 million years ago southern Africa, then part of the supercontinent of Gondwana, was covered with a thick layer of ice. As the weather warmed, the ice started to melt and formed a shallow inland sea covering what is southern Africa and South America today. 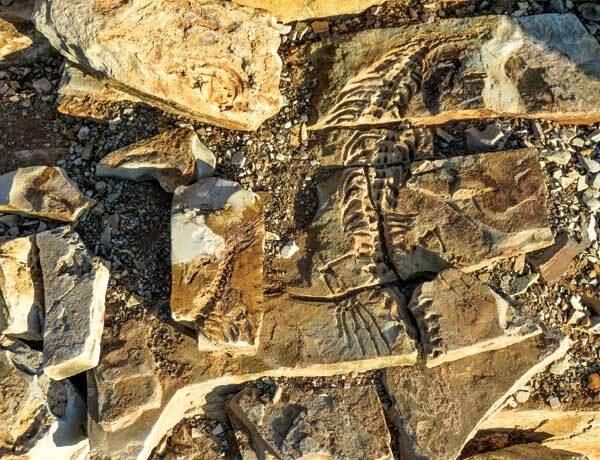 According to Giel, Mesosaurus lived in this shallow sea 270 million years ago and is considered to be one of the oldest reptile fossils found in southern Africa. It died out approximately 250 million years ago – long before the dinosaurs disappeared around 65 million years ago. I marvelled at this infinite Earth journey as the wind blew the bleached grass around us into a butter-coloured sea. Standing next to the grave of a German colonial soldier buried on the farm in 1904 after altercations with the Nama in the area (relatively recent history), Giel showed me a rock that had cracked open exactly along a fissure – like a crystal geode – to reveal two perfect parts of a fossil. “You are welcome to take photos”, he told me and laughed. “It’s not often that you see two fossils in a fossil’s hand,” he said, referring light-heartedly to his advanced age. He also pointed out coprolite, fossilised excrement, which under a microscope reveals what these creatures had eaten for breakfast so many millennia ago. Before we moved on, Giel added some fascinating information about the Mesosaurus fossils that have been found both in southern Africa and South America. They are evidence that the two continents were once joined as one landmass and thus support Alfred Wegener’s theory of continental drift. The fun-filled tour was by no means over yet. We carried on along the farm road until we reached a quiver tree forest where the trees grow abundantly among dark dolerite boulders. The sun generously coated the landscape in a wash of gold as we wandered through the hardy aloe trees. Giel continued to educate me by telling me about the dolerite that had bubbled up as magma below the surface of the earth, before cooling off – and the quiver trees, their hollow branches once used by the early hunter-gatherers to make quivers for their arrows. Small pockets of trees grace southern Namibia and the arid Northern Cape in South Africa. “I want to play you some music on the rocks.” Giel stood in front of two large slabs of dolerite, surrounded by quiver trees, black rocks and a vast blue sky that was quickly turning into a pastel masterpiece. While I gawked incredulously from a short distance away, he picked up a small stone and began to play the popular tune of Frère Jacques, followed by Nkosi Sikelel’ iAfrica. I stood in awe as the hollow sound rang clearly through the quiet afternoon and I hummed the words to myself. Yes, God bless Africa. The sun dipped and the colours deepened around us. The short stop at the Mesosaurus Fossil Site had been a highlight of my trip to southern Namibia, a mix of exciting discovery, like unearthing an old treasure-chest full of gold doubloons, and a celebration of this unusual arboreal arena – with an amusing guide to add to the experience. I had yet to overnight in the rustic and charming chalets under a star-studded sky and to wake to the melodic call of Namaqua sandgrouse on their way to the waterhole. Yet, I wanted to keep the experience somewhere safe in the recesses of my memory. I wouldn’t be able to preserve it for 250 million years, but I wanted some of the simple, natural magic to linger with me for a while longer. 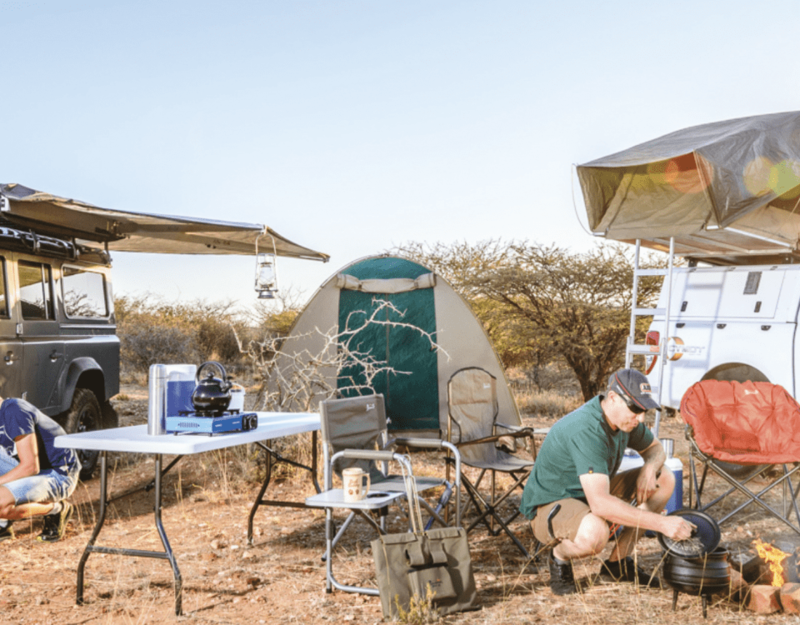 The Camp has 4 self-catering chalets: 3 twin-bed and 1 family, a basic campsite and a bush camp 3 km away from the main camp among the quiver trees. Book ahead for a boerebraai, a farm barbeque of lamb chops, boerewors, homemade bread and salads. Drive the 16 km scenic 4×4 route. Join the one-hour guided tour with Giel to see the Mesosaurus fossils, quiver tree forest and dolerite formations, and the two Schutztruppe graves. Take a hike on the 3 & 10 km trails. Spend sunrise, or sunset, amid the quiver trees. From the B1 just south of Keetmanshoop, turn onto the gravel C17 towards Koës. The Mesosaurus Fossil Site is 39 km along the C17 (suitable for all vehicles). This article was first published in the Autumn 2016 issue of Travel News Namibia.